anancodec → Why my rating is decreasing in proportion of the increasing of my practice? stefdasca → Is listening to Twice boosting cp skills? qqqqq43 → Road to Blue on CF. aryanc403 → Topcoder SRM 756 — Starts in 30 Min. Suddenly, this round will consist of 7 different problems also! Hello! Codeforces Round #555 (Div. 3) will start at Apr/26/2019 17:35 (Moscow time). You will be offered 6 or 7 problems (or 8) with expected difficulties to compose an interesting competition for participants with ratings up to 1600. Probably, participants from the first division will not be at all interested by this problems. And for 1600-1899 the problems will be too easy. However, all of you who wish to take part and have rating 1600 or higher, can register for the round unofficially. The round will be hosted by rules of educational rounds (extended ACM-ICPC). Thus, during the round, solutions will be judged on preliminary tests, and after the round it will be a 12-hour phase of open hacks. I tried to make strong tests — just like you will be upset if many solutions fail after the contest is over. You will be given 6 or 7 (or 8) problems and 2 hours to solve them. Note that the penalty for the wrong submission in this round (and the following Div. 3 rounds) is 10 minutes. do not have a point of 1900 or higher in the rating. Regardless of whether you are a trusted participant of the third division or not, if your rating is less than 1600, then the round will be rated for you. Thanks to MikeMirzayanov for the platform, help with ideas for problems and for coordination of my work. Thanks to my good friends Mikhail PikMike Piklyaev, Maksim Ne0n25 Mescheryakov and Ivan BledDest Androsov for help in round preparation and testing the round. I also would like to say that participants who will submit wrong solutions on purpose and hack them afterwards (example) will not be shown in the hacking leaders table. UPD0: I also would like to thank my friend Adilbek adedalic Dalabaev for helping me with understanding problems difficulty and other help with round preparation! Once again, TREMBLE BEFORE THE MIGHTY OMEGALULRIPGRAPE. We are here to invite you to Codeforces Round #554 (Div. 2), which will take place at Apr/24/2019 17:35 (Moscow time). The round will be rated for all Division 2 participants (with rating less than 2100), yet any Division 1 participants are welcome to join us out of competition. The round will be cat themed. Raise your paws and prepare your catnips! (Or even cat memes, while you're at it). You will be given 6+1 problems ( 6 problems, one of them has 2 subtasks ) to solve in 2 hours. The round's problems were prepared by Xuan-Quang xuanquang1999 D. Nguyen, Duy-Bach Akikaze Le, Stefan stefdasca Dascalescu, Quang-Minh MofK D. Nguyen and our dear Codeforces coordinator Dmitry _kun_ Sayutin. Gladly (or sadly), no interactive problem tonight! Xuan-Tung neko_nyaa Nguyen for testing the rounds and various suggestions in the core theme idea. Nya~. Last but not least, I want to give a huge appreciation to MikeMirzayanov for the awesome Codeforces and Polygon platform, which makes this contest possible. P/s: I will be at the Discord CP Community to discuss the problems after the coding phase. However, please follow the rules and don't discuss the problems during the contest by any means. Wish everyone good luck and high rating! UPD1b: The problemset contains 6+1 problems ( 6 problems, one of them has 2 subtasks ). UPD5: Editorial blog post is available. On Apr/22/2019 17:35 (Moscow time) Educational Codeforces Round 63 (Rated for Div. 2) will start. Series of Educational Rounds continue being held as Harbour.Space University initiative! You can read the details about the cooperation between Harbour.Space University and Codeforces in the blog post. This round will be rated for the participants with rating lower than 2100. It will be held on extended ICPC rules. The penalty for each incorrect submission until the submission with a full solution is 10 minutes. After the end of the contest you will have 12 hours to hack any solution you want. You will have access to copy any solution and test it locally. You will be given 6 problems and 2 hours to solve them. The problems were invented and prepared by Roman Roms Glazov, Adilbek adedalic Dalabaev, Vladimir Vovuh Petrov, Ivan BledDest Androsov, Maksim Ne0n25 Mescheryakov and me. Also huge thanks to Mike MikeMirzayanov Mirzayanov for great systems Polygon and Codeforces. Good luck to all participants! 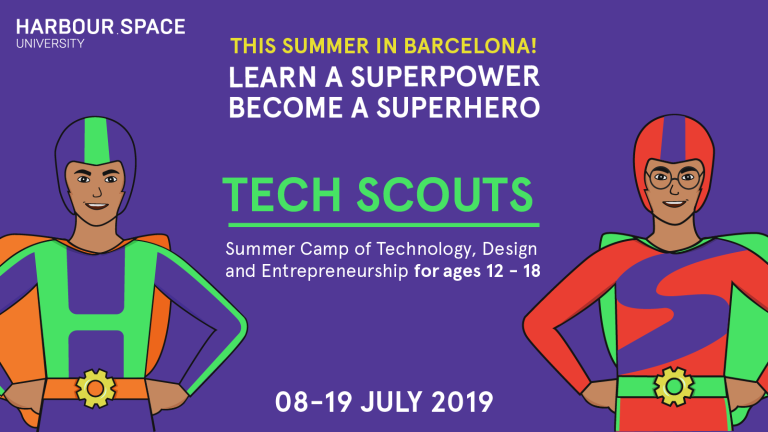 This summer, we want to invite you to Tech Scouts, the two-week summer camp we run from the 8th-19th of July in one of Barcelona's leading international schools, St.Paul’s. This camp, divided into Creative and Technical tracks, is designed to lay out the foundation of knowledge for high-school students in the fields of technology, mathematics, business and design. Both tracks are taught in English. We would love to see you guys at our camp this year — if you’re interested in joining, or if you just want to know more, just head over to the Tech Scouts website. This camp is for anyone passionate about tech or design, so if you know someone who might be interested, be sure to let them know too! UPD: The round will contain 6 problems. 790 successful hacks and 697 unsuccessful hacks were made in total! I'm excited to announce the Forethought Future Cup! It will consist of two rounds, an online round on April 20th, 11:05am PDT, and an onsite round on May 4th, 10:05am PDT. Both of these rounds will be rated and open for all participants. The top 25 local contestants near San Francisco will be invited to the Forethought office to take part onsite. Each round will be a combined round. In the first round, there will be 8 problems in 2.5 hours. There will be at least one interactive problem in this round. Please read the interactive problem guide if you haven’t already. The problems in this round were all written by me. Thanks to ismagilov.code, mohammedehab2002, Jeel_Vaishnav, Learner99, dojiboy9, fortune, y0105w49, KAN, arsijo for testing and coordination. Of course, thanks to MikeMirzayanov for Codeforces and Polygon, and for allowing us to host the round. At Forethought, our mission is to use AI technology to augment human abilities and make everyone “a genius at their job”. Our main product is Agatha, an assistant that helps customer support agents answer cases more quickly and confidently by suggesting answers and triaging cases. We've raised over $10M in VC funding and were the winners of 2018 SF TechCrunch Disrupt Battlefield. I joined Forethought back in December 2018. We are a small 12 person startup, and have a lot of competitive programmers on our team, including me, y0105w49, fortune, and dojiboy9 (our CEO, who is also an ICPC World Finals Judge). I’m happy to answer any questions about working here in the comments below or through PM. We’re hiring! Please fill out this form if you are interested. UPD 3 Congratulations to the top 5! Codeforces Round #553 (Div. 2) will be held on Apr/18/2019 18:35 (Moscow time). Round will be rated for second division (rating below 2100). As usual, participants from the first division can participate in the contest out of competition. My gratitude to arsijo and KAN for coordinating the round, Markellonchik (special thanks for the help in preparing one of the tasks), mohammedehab2002, Jeel_Vaishnav for testing, and also 300iq for the idea and preparation of one of the tasks, aleks5d and isaf27 for testing it, and of course MikeMirzayanov for Codeforces and Polygon systems. In this round you will help the residents of the Kingdom of Kremland. I strongly recommend you to read the statements of ALL tasks (and of course, try to solve them). UPD: Thank you for your participation in this round! Congratulations to the winners! This time I have nothing to say except that this round will consist of 7 different problems! Hello! Codeforces Round #552 (Div. 3) will start at Apr/16/2019 17:35 (Moscow time). You will be offered 6 or 7 problems (or 8) with expected difficulties to compose an interesting competition for participants with ratings up to 1600. Probably, participants from the first division will not be at all interested by this problems. And for 1600-1899 the problems will be too easy. However, all of you who wish to take part and have rating 1600 or higher, can register for the round unofficially. UPD: Thanks to le.mur for idea of one of the problems. UPD2: Editorial is published now! 949 successful hacks and 502 unsuccessful hacks were made in total! We are glad to invite you to our first Codeforces Round Codeforces Round #551 (Div. 2) which will be held on Apr/13/2019 17:05 (Moscow time). This round will be rated for participants with rating less than 2100. We will be glad to see participants from the first division to join out of competition as well! In this round, as the best friend of Serval's, you are going to help him to solve the problems he meets. Great thanks to 300iq for coordination of this round, isaf27, gritukan, KAN, mohammedehab2002, learner99, aleks5d and Um_nik for testing our rounds, and MikeMirzayanov for the amazing Codeforces and Polygon platforms. You will be given 6 problems to solve in 2 hours. Scoring distribution will be announced later. Please pay attention that there will be an interactive problem in this round, so learn more about interactive problems here before the contest. UPD: Scoring distribution is: 500-1000-1500-1750-2250-2750. UPD2: Thank you for your participation in this round! Congratulations to the winners! UPD3: Sorry for the delay. The editorial is available. At Apr/06/2019 14:35 (Moscow time) we will host Codeforces Global Round 2. It is the second round of a new series of Codeforces Global Rounds supported by XTX Markets. The rounds are open for everybody, the rating will be updated for everybody. 30 best participants get a t-shirt. 20 t-shirts are randomly distributed among those with ranks between 31 and 500, inclusive. In each round top-100 participants get points according to the table. The final result for each participant is equal to the sum of points he gets in the four rounds he placed the highest. The best 20 participants over all series get sweatshirts and place certificates. The problems of this round were developed by a team of authors: 300iq, cyand1317, Aleks5d, RDDCCD, KAN, gen. Thanks KAN for his help in the round's coordination, and also isaf27, lewin, osaaateiasavtnl., Errichto, arsijo, _kun_ for testing the round! 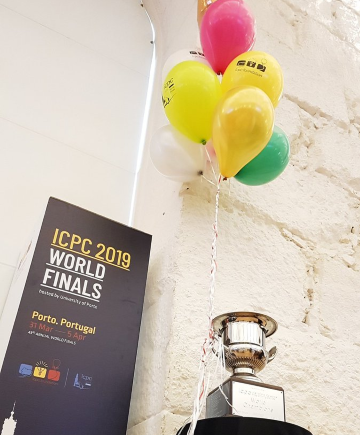 ICPC World Finals 2019 will begin on April 4, 2019 at 11:00 (UTC). This event is the main event of the year in the world of sports programming! In the past 20 years alone, ICPC participation has increased by more than 2000%. The contest evolved into its present form as a multi-tier competition in 1977, with the first finals held in conjunction with the ACM Computer Science Conference. Last year, ICPC Regional participation included 52,709 of the finest students and faculty in computing disciplines from 3,233 universities in 110 countries. We remind you that in the current world champion is the team of Moscow State University. Codeforces wishes the teams to show a vivid and interesting contest. We wish to find beautiful solutions, write without bugs and enjoy many accepted problems! Server time: Apr/26/2019 05:58:34 (e1). Desktop version, switch to mobile version.